Mountains and Rivers Order based at Zen Mountain Monastery, in upstate New York. ​​Friday, 13 July, 7.30pm. Fairfield House, 48 Van Diemen St, Nelson, New Zealand. We have all had the experience of deciding not to act out of some familiar, negative pattern of thinking, speech or action, only to watch almost helplessly as we fall again into that very cycle. On the Buddhist Path, examining and understanding karma – cause and effect – is essential if we are to break those binding patterns and live more fully and freely. 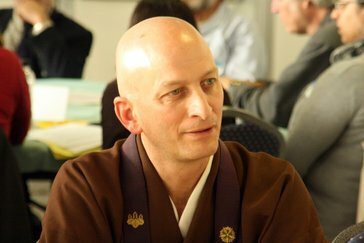 In this evening talk, Shugen Roshi will offer basic teachings on karma to help us to better understand how we can each live more in accord with our deeper intentions. There will also be time for questions and discussion. related through my actions, and have my actions as my arbitrator. ​Whatever I do, for good or for evil, to that will I fall heir."